No exception is indicated for “insured deposits” in the U.S., meaning those under $250,000, the deposits we thought were protected by FDIC insurance. This can hardly be an oversight, since it is the FDIC that is issuing the directive. A draft European Union law voted on Monday would shield small depositors from losing their savings in bank rescues, but customers with over 100,000 euros in savings when a bank failed could suffer losses. Other countries have hopped on the bail-in bandwagon, but you get the idea. ISDA is consulting on a proposal to add another credit event for financial credit default swaps in order to adapt to sweeping changes in regulation that will give supervisory authorities the power to bail-in the debt of floundering institutions. And they are once again granting what are called “covenant-lite” loans. For Jose Santos Benavides, the ordeal of losing his home was over. The Salvadoran immigrant had worked for years as a self-employed landscaper to make a $15,000 down payment on a four-bedroom house in Rockville. He had achieved a portion of the American dream, earning nearly six figures. Then the economy soured, and lean paychecks turned into late mortgage payments. On Aug. 20, 2008, one year after he bought his dream home for $469,000, the bank’s threat to take his house became real via a letter in the mail. Just four days before the bank seized the property, he moved out, along with his wife and their two young children. In November, more than three years after the foreclosure, he was stunned to learn he still owed $115,000 — with the interest alone growing at a rate high enough to lease a luxury car. The 42-year-old is among the many homeowners being taken to court by their lenders long after their houses were taken in foreclosure. 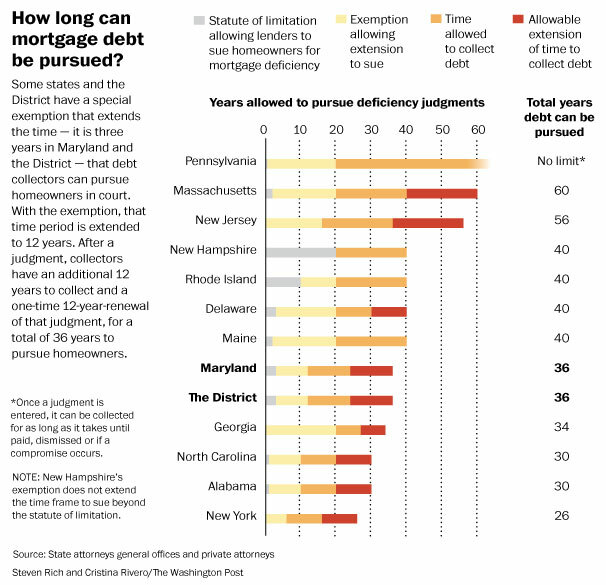 Lenders are filing new motions in old foreclosure lawsuits and hiring debt collectors to pursue leftover debt, plus court fees, attorneys’ fees and tens of thousands in interest that had been accruing for years. A top U.S. banking regulator called Deutsche Bank’s capital levels “horrible” and said it is the worst on a list of global banks based on one measurement of leverage ratios. “It’s horrible, I mean they’re horribly undercapitalized,” said Federal Deposit Insurance Corp Vice Chairman Thomas Hoenig in an interview. “They have no margin of error.” Deutsche’s leverage ratio stood at 1.63 percent, according to Hoenig’s numbers, which are based on European IFRS accounting rules as of the end of 2012. Deutsche Bank is the biggest player in the world in the risk-laden derivatives market. At last count, they had $73 trillion in derivatives outstanding, which is over twenty times the size of the German GDP, so if Deutsche Bank has a derivatives blow up, it’s unlikely that Germany or anyone else would be able to afford to make good on their losses. After all, $73 trillion is larger than the entire world GDP. And why is it that, as stated above, there have been no attempts to really solve EU bank problems? It’s very simple: too much debt was issued to buy assets (e.g., real estate), pushing up the price of those assets to unrealistic levels. There are real losses that need to be taken, and no one wants to take the losses. All involved prefer to pretend that there are no such losses, so they use near-zero-interest bridge loans, accounting lies, and round robin I’ll-lend-your-bank-money-to-buy-your-government-debt-and-you-use-the-proceeds-to-bail-out-your-bank games to mask the truth. With non-performing loans at EU banks at record highs and growing by the day, good luck with that. That’s more than $6 billion being withdrawn in April, after the March bail-in. So that bank stock that people received in return for their “expropriated” deposits? Must be worth a fortune. If people still received stock certificates as a matter of course, at least these could be framed as memorabilia, yet another testament to the financial follies of humanity. But it’s all just electronic entries these days. Switch a few bits and bytes and then who owns what? 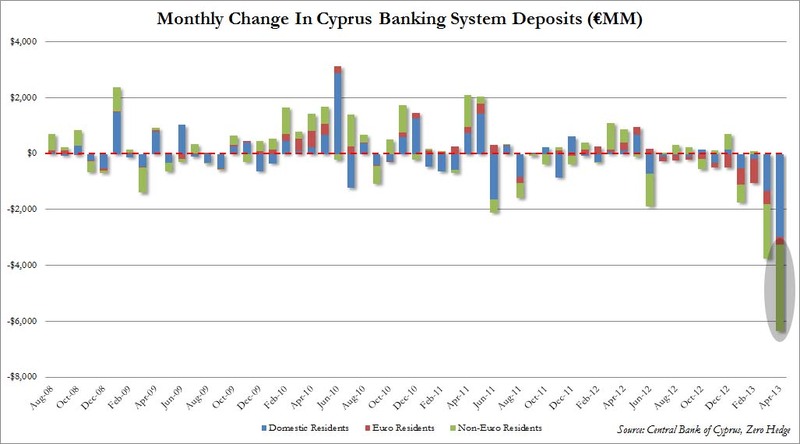 Think Cyprus is the only country that will need a repeat bailout (as the FT reported earlier)? Think again. Cause heeeeere’s Greece… again…. where as Kathimerini reports, a brand new, massive budget hole for €1.2 billion has just been “discovered. Professors Lars Feld and Peter Bofinger said states in trouble must pay more for their own salvation, arguing that there is enough wealth in homes and private assets across the Mediterranean to cover bail-out costs. “The rich must give up part of their wealth over the next ten years,” said Prof Bofinger. And last but not least, you know all that money sitting in retirements accounts? Multiple countries have nationalized such accounts in recent years. People like former Republican Administration insider Catherine Austin Fitts have been warning people that US politicians salivate when they contemplate getting their hands on that pool of $18 trillion. 1. You’ve heard the old saying about someone who “wants your money in their pocket.” The problem here is most people’s money is already stored in “their pocket,” that is, it’s already being held by the institutions that want to grab it. 2. That thing about the banks going after people for more money after they have already foreclosed on them? Too bad we don’t have a Charles Dickens around to dramatize this type of behavior, maybe then people would get the depth of depravity in this system. 3. Tread carefully out there, folks, it looks like acceleration spares nothing, so I think you want to be real careful about “wait and see.” You know my view: banks are for transaction accounts, not savings. Next time we’ll cover another big pile of electronic money, brokerage accounts. This entry was posted in Financial System, Transition and tagged bail-in, bailout, bank accounts, banks, banksters, Cyprus, derivatives, financial system disintegration, foreclosure, Greece, robo-signing, wealth tax by Thundering Heard. Bookmark the permalink.